Donovan’s Steak and Chop House is a little piece of steak paradise, an homage, really, to the long tradition of steakhouses so popular in America since the early 20th century. But Donovan’s is no throwback. At their handsome location at 3101 E. Camelback Road in the upscale Camelback Corridor, owners Dennis Hitzman, Tony Subia, and Mal Jozoff have created a clubby atmosphere of casual elegance with no fine-dining detail overlooked. 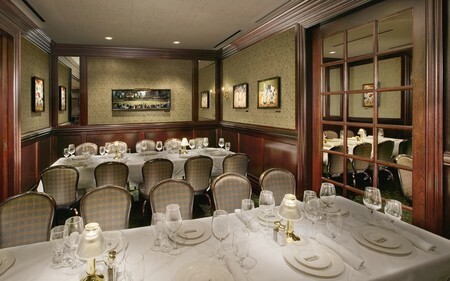 The centerpiece of their award winning operation is the exclusive use of USDA Prime, Midwestern, corn-fed beef, which, combined with an international wine list, accommodating staff, and exclusive amenities, makes this a steak lover’s paradise. Donovan’s is located in a free-standing building of ochre-colored stucco with a domed portico roof of gleaming copper and a beautifully paved stone entry court yard. All parking is by valet and is only the beginning of an evening of friendly, first-rate service. Inside, the restaurant is like an old-school club or library, paneled in dark wood with soft lighting and cushy carpeting under foot. Oil paintings line every wall and bronze and silver sculptures and bouquets of flowers complete the look. To the left, and separated from the main dining room by a wall, is the wine bar lounge with its sparkling back mirrors and tall stools. There are also tables for quiet conversation or dining, if you prefer. This is where the terrific bartenders offer up their premium brands and huge wine list, as well as Donovan’s delicious happy hour freebie: Prime filet steak sandwiches with creamy horseradish sauce. The gracious hostess, Tristan, does the seating, offering a choice in the large dining room of either a table or a cozy, green leather booth. If you become a regular guest, you can have your name on a plaque on the wall behind your favorite spot. Service is performed by teams of three. My team of Captain Darko, Ben, and Raul were very personable, solicitous and completely professional, having the impeccable service down to a fine tuned ballet. Introductions are done, Donovan’s bottled water is poured, menus are delivered, and drinks discussed. Each team member is well versed in the huge wine list, stored in the elegant wine room visible through a wall of glass from the entry. Several hundred bottles, including recognizable names and many exceptional boutique brands from around the world, make up the collection, which has garnered the Best of Award of Excellence from Wine Spectator Magazine. Wanting to try something new to my palate, I challenged Ben to find me a white wine, very well balanced between dry and sweet. He offered me a taste of one, which didn’t fill the bill, but the very next try was the perfect choice, a Sterling 2005 Chardonnay. Then Raul brought the crusty, hot fresh baked bread, the flavor of which matched the tantalizing yeasty aroma. Perusing the menu, you can see why Donovan’s motto is “100% prime, 100% of the time.” It truly is a beef lover’s paradise. 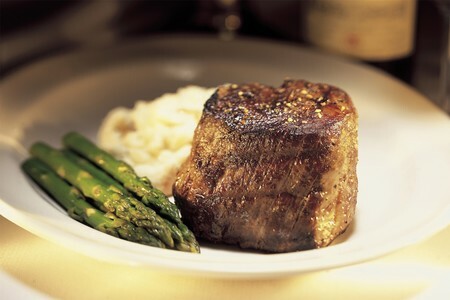 Filet mignon comes in three weights, one of them a peppercorn variety. Two weights of New York strip, three of ribeye—one of which is a 24-ounce (!) chop—a T-bone, and a Porterhouse are all on offer. Center-cut pork chops, Australian rack of lamb, and a center cut veal chop round out the meat selections. For the seafood choices there are broiled shrimp scampi, North Atlantic salmon, Australian rock lobster tail, and Alaskan king crab. For appetizers, there are seven choices. Try the Seared Lamb Chops, with a dusting of Cajun spice, served on a bed of bright purple braised cabbage with ranch dipping sauce in a hollowed out baked potato. Or ask for the Bacon Wrapped Scallops. They are served up sweet and tender, with a nice firm bite and infused with that smoky bacon flavor and a light pan sauce with a little tomato and onion. There is a different soup each day and six salads. The Asparagus Salad was composed of three of the largest deep -green spears I’ve ever seen. They were perfectly cooked, icy cold, and crunchy, dressed with a balsamic vinaigrette and sprinkled with marinated, roasted red bell peppers and plated with a tiny mound of field greens. Chef Robert Nixon uses an 1800-degree Montague oven to sear the meats, which produces a heavy crust and a heavenly interior, done just to the diner’s specifications. And each order comes with a choice of one of four different varieties of potato and a daily vegetable. The 16-ounce Cajun Seasoned Ribeye was tender and flavorful. It was accompanied by Skillet Fried Potatoes—Donovan’s special recipe of sliced baked potatoes layered with sautéed onions and bathed in peppercorn gravy—and a crisp snow pea and carrot combo for color and crunch. The small Filet Mignon had the same rich crust with a buttery interior, served up with another of the potato choices, Garlic Smashed Potatoes, with a whiff of garlic and flakes of peel throughout. Preparation of the seafood is as meticulous as the meats. Chef Rob’s recent menu addition of Pan Seared Halibut was as long as my hand and two inches thick. It was perfectly cooked, golden crusted, moist, and flakey, served in a flat bowl and stacked with julienned shitake mushrooms and sun-dried tomatoes, drizzled with a lemon caper sauce and topped with a mountain of thin and crisp shoe-string potatoes. If you have room left, there are desserts to be considered. Triple Chocolate Brownies or Chocolate Mousse Cake, for example, or my choices, Crème Brulee and Key Lime Pie. The Crème Brulee was creamy and rich but not too sweet and the burnt sugar on top was crisp without a hint of bitterness as sometimes occurs in the wrong hands. The Key Lime Pie was just tart enough and the creamy texture paired nicely with the crunchy graham crust. General Manager Richard Schumacher and his professional team have created a dining destination with Phoenix’s Donovan’s Steak and Chop House. Besides the best in award-winning food and wine, their operation can offer catering and private facilities for groups of 10 to 120, complete with several menu and wine pairing offerings, the most current audio-visual equipment, and electronic gizmos. Catering Manager Carrie Schmidt will charmingly see to all of your needs. Need a ride to dinner for a few friends? Give them a call; they will come get you in the 12-passenger DonoVan. Did I mention they have amenities? While dining, between courses, the staff whisks away the crumbs, refills water and drinks, and tidies the table with finesse, genuine smiles, and low murmurs. At the end, they package the take-homes in beautiful black boxes with Donovan’s signature seals, wish you a pleasant evening, and hope to see you again soon. If I have my way, they certainly will see me again, the sooner the better. 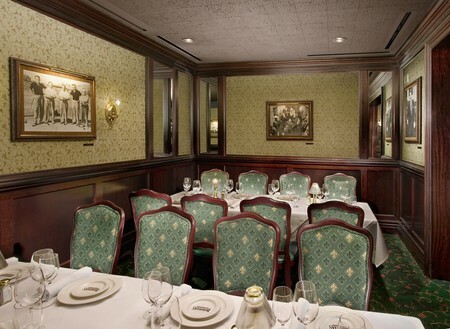 Main Dining Room | Happy Hours 4 p.m. - 8 p.m.
Main Dining Room | Bar 4 p.m. - 10 p.m. Au Gratin, Baked, Garlic Smashed, and Skillet Fried. Barrel Cut. Most tender of our steaks. Barrel cut. The most tender of our steaks. Delicately petite for smaller appetites. 10oz. lightly crusted with crushed peppercorns. 16oz. Very tender, well marbled. 20oz. Combination of strip and full filet. 16oz delightful strip and tender filet. 24oz. Big hearty, and full of flavor. I have dined in some of the best Steak and Chop Houses across America. None compare to Donovan's in price value, food, customer service and atmosphere. These are the reasons why I dine at Donovan's at least four times per month. Regular customers are recognized by a warm and cordial staff...they know your name, favorite drink and have a way of making you feel welcomed. My guests are always impressed with the total experience. 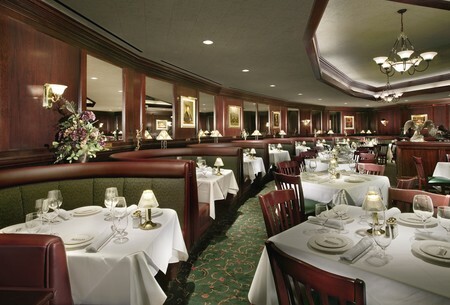 If you are a steak and chop lover, Donovan's is a must! I promise, you won't be disappointed. Best Steak in the West! I've been to some great steakhouses in the Western States, including Nevada, California, Colorado, Texas and Arizona. Hands-down Donovan's reigns supreme. Everything I order is always excellent and my personal favorite is the Prime Porterhouse and as an alternative the Seafood Tower is to die for! Donovan's consistency and quality of service is unmatched. I've been to the San Diego and Phoenix restaurants and time-after-time it's always perfection in service, ambiance, and that Porterhouse, is always right-on! If you want the best, I highly recommend Donovan's of Phoenix. 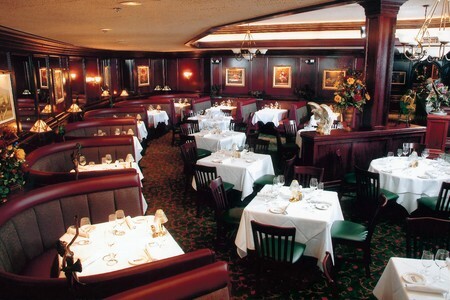 We have dined at Donovan's of Phoenix many times - "Donovan's is fantastic" the service is better than excellent - Donovan's is top of the line for fine dining. By all means everyone who wants "Good tasty food" and excellent service should stop by Donovan's you will want to make this your special place to relax and have a wonderful time. The best yet is the dessert.....you will have to stop by for this special treat. This was our first time visiting the resturant, the staff was wonderfull, the food was great, We will return again and again. Bring a coat for the ladies they may get cold. This is an experiance that will keep you returning! 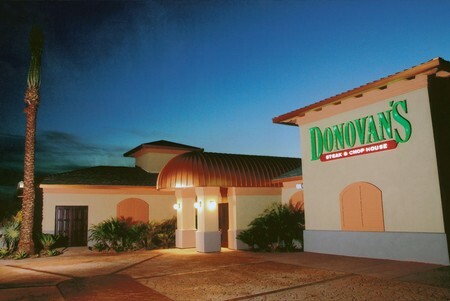 Have eaten at many, many, maybe too many restaurants and would put Donovan's of Phoenix up in the top five. Donovan's provided a great table for a large group. The table was mostly isolated from the rest of the restaurant, allowing us to hold a secure discussion concerning business development. The meal was excellent; service was attentive and unobtrusive. Dinner with my wife on Friday night. The restaurant decor was nice but unusually chilly inside. The service was friendly and helpful and the food was good but really just average for the price. The overall experience was enjoyable and I would probably go again. The atmoshere was nice but the prices were too high for the quality of the food. The wine list was reasonable, and they had some nice wines by the glass. From the reviews I read and the menu pricing, I was expecting much more. The steak wasn't prepared properly which you expect a restaurant of this caliber to get it right and the Shrimp Scampi was not Shrimp Scampi and the portion was absolutely pathetic.